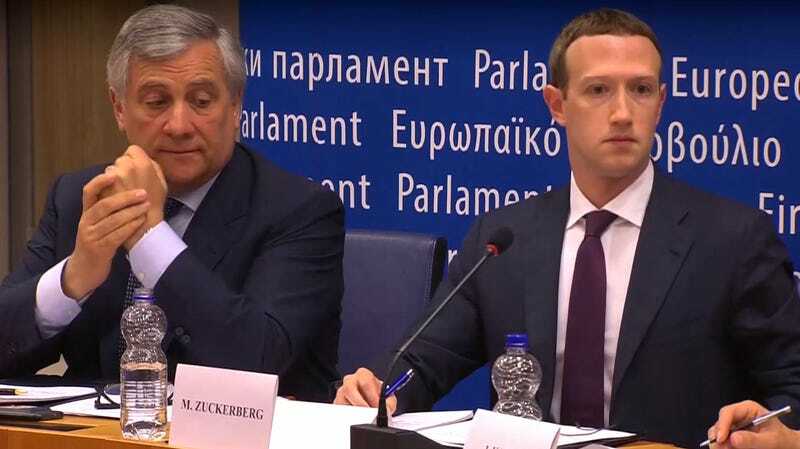 For a moment, Mark Zuckerberg’s appearance before members of the European Parliament looked like it was going to be a very bad day for the Facebook CEO. Then he started answering questions, a flood of pablum spewed from his mouth, and everyone got angry. 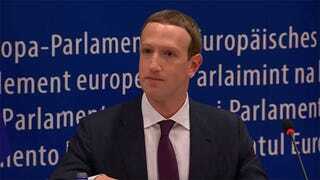 In the lead up to Zuckerberg’s first appearance before politicians in Europe since the Cambridge Analytica scandal broke, it was widely expected he’d face much tougher questions than he did in front of the US Congress. Not only are Europeans generally more protective of privacy and more open to breaking up monopolies, but the EU is implementing its long-awaited GDPR privacy protections at the end of the week. Here we have governmental authorities actually imposing regulations rather than just talking about it, and there are numerous indications that Facebook is already worming its way around them. Indeed, the leaders of European Parliament’s political groups had some hard-hitting questions for Zuckerberg. Some even followed up on questions raised by the Senate that have remained unanswered since April. Most questioners seemed to have a better grasp of the issues at hand than the majority of Congress. And the majority of the questions were quite specific, such as, “Will Facebook allow all users to completely opt-out of targeted advertising?” But the format that was chosen completely screwed up any chance of getting a straight answer from Zuckerberg. Rather than giving each Member of Parliament time to ask a question, get an answer, and followup, everyone asked their questions in the beginning. Each member threw out around six questions and Zuckerberg was given the chance to respond to the dozens of inquiries all at once. At first, this seemed to be getting under the CEOs skin. A huge number of issues were raised in rapid-fire succession and I wondered how he’d possibly address each concern. In the end, he didn’t. The session went over its allotted time and Zuckerberg announced that he would wrap up. He lamented that “there were a lot of specific questions that I didn’t get to specifically answer,” but he was pleased that he “was able to address the high-level areas” of everyone’s concerns. This didn’t sit well in the room. Various members began pointing out which questions went unanswered. Belgium’s Philippe Lamberts angrily pointed out that he phrased all six of his questions for yes or no answers and received no response. Lamberts laid it out plainly, “of course, you asked for this format for a reason.” It was unclear whose idea this odd format was before Lamberts scolded Zuckerberg. Zuckerberg tried to explain that Facebook has announced a clear history tool that will let users wipe all basic browsing history data. He explained that the company keeps tabs on non-users to make sure they aren’t scraping data and to monitor “how people use our service.” Kamall interrupted to ask how a non-Facebook user can stop their data from being transferred to Facebook’s system. “On the security side, we think it’s important to keep it to protect people in our community,” Zuckerberg responded curtly before turning to his counsel and changing the subject. In the end, no one seemed satisfied today but there was the appearance of a promise to follow-up on questions in writing. That promise came from Zuckerberg’s lawyer. The questions that went unanswered at his two sessions in Congress still linger, but we know that’s in part because Republican lawmakers haven’t followed up. Something tells me the Members of Parliament will. Below, you’ll find every question that Mark Zuckerberg was asked and failed to answer with specifics. We’ve paraphrased many of them for the sake of clarity. Is Cambridge Analytica an isolated case? Can you guarantee that another scandal will not happen in three, six, nine months’ time? Did you personally make the decision in 2015 to not notify your users about the loss of their data to Cambridge Analytica? And why was the decision made not notify users? Is there an alternative to Facebook’s services in Europe today? Would you consider your company a monopoly? I think it’s time to discuss breaking up Facebook, can you convince me not to do so? Are you ready to completely comply with the new GDPR regulations within the next three days? Can you guarantee that Facebook is in line with the new rules? Can you guarantee that you will not collect and sell any data to third parties without proper consent especially if people want to leave Facebook? How quickly and under what conditions will users who leave Facebook’s data be fully removed? How can you explain that the number of false accounts on Facebook are on the rise? What are you doing to target specifically sophisticated fake accounts, especially when it comes to political manipulation? Are you ready to guarantee that upcoming European elections will be free of manipulation from foreign and hostile powers? How can you adapt your business model to make this guarantee? Facebook has admitted to creating “shadow profiles” of people who surf the web but don’t have a Facebook account. Is avoiding the internet entirely the only way to prevent Facebook from collecting my data? What do you do with the data from non-Facebook users? Do you commercialize it? Is that morally acceptable? Is a non-Facebook user able to see the data that’s been collected? If not, why not? Are you telling us the truth when you say that you will apply GDPR privacy standards? Because there are already indications that you’re violating the regulations. Article 82 of GDPR gives the ability of compensation for users who have their rights violated. Will you compensate European Facebook users when you violate GDPR and what will be the amount of compensation? Will you cooperate with European authorities, open your books, and allow us to see if Facebook is a monopoly? Would you be open to the idea of splitting off Messenger and WhatsApp, but keeping Instagram under the Facebook umbrella? How will you be remembered: As one the three big internet giants along with Steve Jobs and Bill Gates who have enriched our world, or as the genius who created a digital monster that is destroying our democracy and society? Will Facebook promise “systematic” and “public” transparency on all electoral campaigns? Will Facebook allow all users to completely opt-out of targeted advertising? Does Facebook provide media or curated content, or is it a neutral platform? Will Facebook voluntarily commit to publishing the list of its legal entities, the number of people they employ, their turnover, their profits or losses, and the taxes they pay or subsidies they receive, on a country by country basis? Will Facebook commit to paying taxes in the countries where it operates? You’ve stated that you support the GDPR privacy regulations and that you’ll apply it globally “in spirit.” What does that mean, exactly? Have you really moved the data of users that was stored on servers in Europe so that data would be outside the effective reach of European authorities? You’ve spent a lot of money on lobbying to delay the implementation of data protection regulations. Is this really in the interest of Facebook? How has the culture at Facebook changed in relation to discrimination against women, sexism, and violence against women since the days when it was a “hot or not” website? Would you accept a social media bill of rights that guarantees the basic protection of freedom of speech? (Relating to fake news as well as personal expression.) Is the arbitrary censorship carried out by Facebook compatible with the fundamental values of our democracy? What legal basis do you have for deleting Facebook pages based on religious expression? Is the hunt for fake news becoming an excuse to hunt and silence freedoms of opinion and expression? Can you explain to us what you are doing to work with third-party organizations to try to educate people on safety when using the Internet? Can you say you are comfortable that everyone’s children will be kept safe when using the default settings of your website? (In relationship to hate speech, terrorism, and offensive posts) Can you tell us how you define acceptable comments on the site? Does Facebook check third-party company’s compliance with its policies? How will you ensure that this really happens? Which specific things will Facebook do to prevent another scandal from happening? Is Cambridge Analytica just the tip of the iceberg when it comes to mishandling users data? Why didn’t you inform users that their data had been compromised and give them a chance to take measures to further protect their data? Are you going to give users total access to their related marketing materials, as is required in GDPR? Will you assure that no Facebook user or future Facebook user will be required to give consent for the use of their personal data any further than is necessary for use of the service? You told the Senate that Facebook collects and keeps some data for security purposes. Can you promise that this data which you keep for security purposes is not used for other services or purposes like targeted advertisement? Can you promise that the data of European users will not be used or exchanged between the WhatsApp and Facebook services?